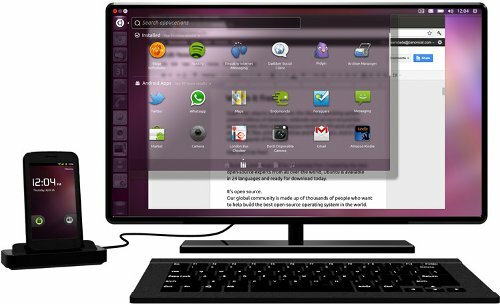 Canonical has unveiled a revolutionary concept called Ubuntu for Android. The idea is for Ubuntu to reside along side Android in your high-end mobile phones thus bringing a complete computing experience to the end user. The high end cell phones available in the market today are as powerful as a desktop computer. Sporting dual cores, these high-end cell phones can easily run a traditional OS. Realizing this fact, Canonical has come up with an innovative idea - running 2 operating systems namely Android and Ubuntu from the same mobile device. When in normal use, the cell phone runs Android OS. However, the moment you dock your cell phone with a PC or a dumb terminal, the cell phone boots up Ubuntu and seamlessly mirrors the Ubuntu Desktop on the terminal / PC monitor. What you get on your PC monitor / Dumb terminal / smart TV is a full Ubuntu desktop that is capable of running any Linux application. Enterprise IT departments who embrace the Ubuntu for Android project can save money in providing a laptop to their personnel. Unified contacts - Both Ubuntu and Android access the same mobile address book. This means you can view and edit all the contacts in your cell phone while in your Ubuntu Desktop. Calendar coordination - All the agenda you set in your cell phone gets carried over to your desktop when you are working in Ubuntu. And any changes you make in your agenda is synchronized with your cell phone and vice versa. Read and reply to incoming SMS in real time right from your Ubuntu Desktop. Social networking services integrated seamlessly - Eg Facebook, and Twitter. Best of both worlds - Use a full sized keyboard, a mouse, and a large display monitor to comfortably do your work. At the same time, use touch screen while on the move and when making calls. You simultaneously get the power of Ubuntu and Android on a single device. You need a high end cell phone - preferably powered by a multi-core processor (More cores the better). Your high end cell phone needs the docking capability and hardware support for HDMI and USB. Your cell phone must be running Android Gingerbread or higher version. The details of this unique project (Ubuntu for Android) can be read at the Ubuntu website. [Source : Canonical official press release ].